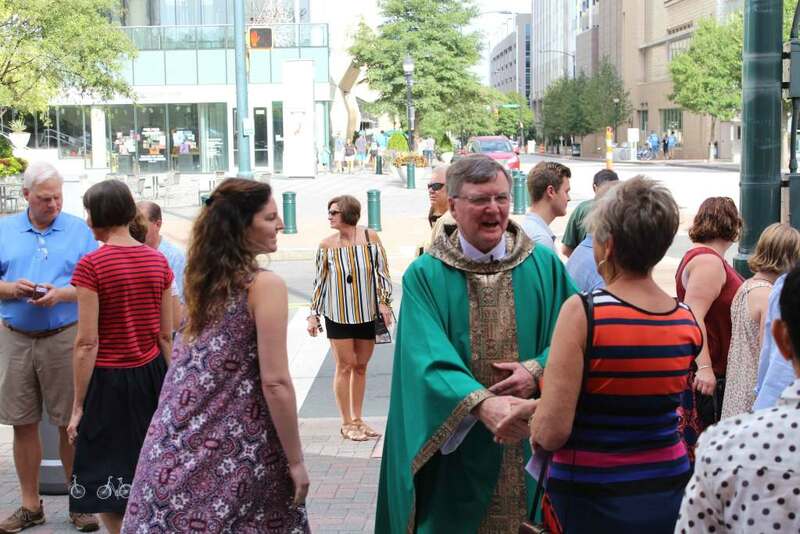 Fellowship Committee: Volunteers help organize and serve at fellowship events such as Coffee on the Plaza, Jesuit Alumni & Friends reception in October, Parish Brunch in August, and special occasions. Caring Cooks - The role of a “Caring Cook” is to prepare (or purchase) a meal and deliver it to a parish family who has a new baby or is experiencing illness. Recipients need not be unable to cook, just in need of a little care and concern. Caring Cooks also provide meals to our St. Peter Jesuits two nights per week. Parishioners who would like this service or know of someone who might, should call the Parish Office at 704-332-2901 or email Donna Hanson at [email protected]. Girl Scouts Troop 10 - If you or your daughter has an interest in information about Girl Scouts, Joanne Shea, the St Peter Girl Scout Liaison, will help you. Contact: Joanne Shea or 704-651-7142. St. Peter Men's Group - 3rd Thursday of each month 8:00-9:30 pm in Benedict Hall 2nd floor conference room. See page link for new event in May! Parish Gardens - St. Fiacre ministry - meets a few times a year to tend the gardens on campus. Youth Group Ministry - quarterly events include service projects. Hiking Group - 1st Saturday area hikes. Please see the bulletin for more information, or contact Bob Crowley at [email protected]. St. Peter Men's Group - 3rd Thursday of each month 8:00-9:30 pm in Benedict Hall 2nd floor. See next event! Youth Group Ministry (12 -17 yrs.) - quarterly events to promote fellowship and friendship among our teens. Jesuit Alumni & Friends - Our annual opportunity for alumni and friends of Jesuit schools to share our common bonds through liturgy and fellowship. Annual event in October.